The massive gap of affordable housing has drawn the Government of India’s focused attention and resulted in many initiatives to such housings. Cognizant of the constantly growing demand for affordable homes across the country, the market has started responding with a significant rise in new launch supply in this segment over the last one year. The chart below shows the share of newly-launched affordable housing units (< Rs. 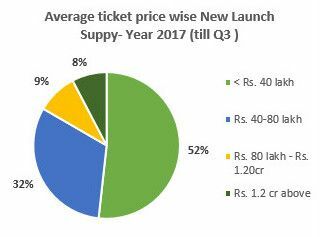 40 lakh) during Q1- Q3 2017 across all the top cities. 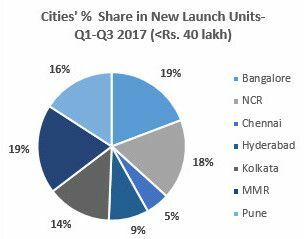 Bangalore, MMR, NCR, and Pune are close together in terms of volumes, accounting for around 16 to 19% share of units in the sub-40 lakh price bucket.